I’ve already written several times about Akka and async programming with it. For example doing access files and webservices with it. So async API stack is complete, right? We’ve got async network and web access via NIO and frameworks like Play 2.0, Spray, HTTPClient etc. And with NIO 2 we easily can access the file system in asynchronous way. But wait, what about your database? What if tons of your data sits in a good old relational database? Unfortunately the current JDBC model is blocking by definition. No asynchronous operation is allowed. The standard way of doing things for async SQL operations is to use some background threads and do things there. And for many applications this is good enough. But if you do more and more db operations you start to consume more and more threads, which will be waiting for blocking operations. Wouldn’t it be nicer if the database operations are truly asynchronous like other operations? 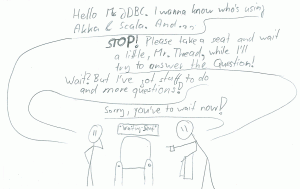 So I’ve looked for an alternative to JDBC. I’ve found two approaches to provide a asynchronous JDBC alternative. The async-mysql-connector and ADBCJ. Unfortunate both are not really actively maintained. Anyhow I decided to go ahead with ADBCJ. More about that later. Let’s first take a look at how we to use everything. case StartRow(jsonToBuild) => jsonToBuild + "-"
case EndRow(jsonToBuild) => jsonToBuild + "\n"
And also a .withTransaction exists. It does the same for the transaction. It will commit it if the given closure finishes regular. It rolls the transaction back if the closure or the returned future fails. Now the stuff above is just a thin wrapper around the ADBCJ API. It’s basically a JDBC clone, where all operations are asynchronous. That also means that it requires a driver which implement the operations asynchronously. Originally three drivers where around. A MySQL driver, a PostgreeSQL driver and a Bridge to JDBC. Of course the JDBC bridge cannot remove the blocking calls. It just just executes them on worker threads. So it doesn’t bring a real benefit. 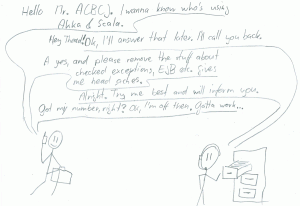 Now unfortunately the ADBCJ implementations were only proof of concept implementations. So I forked it on Github, fixed the worst issues and implemented a few missing features. But I did that only for MySQL. So what’s the exact state of it? The MySQL and JDBC bridge are up to date. The basics work: Transactions, queries, prepared statements etc. The PostgreeSQL compiles, but I haven’t maintained it. Didn’t bother to run the tests. Prepared statements not implemented. Many data type implementations are missing. The test suite is not in a good shape. I’ve improved it a lot, but it is still very minimalistic. It just doesn’t cover enough. It’s just far away from rock solid. 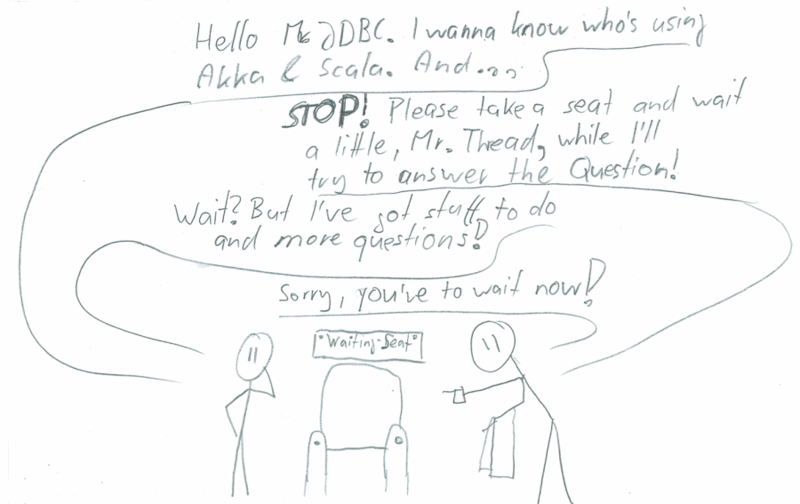 So for a real world application, ADBCJ would need a lot of work. First to improve the MySQL implementation and second to support other databases. Unfortunately this is tedious database protocol implementation work, which isn’t fun. So unless someone is really desperate, it will never be done. Hopefully, JDBC version 42.0 will include async operations, and async operations can be done easily ;). libraryDependencies += "info.gamlor.akkaasync"  %% "akka-dbclient" % "1.0-SNAPSHOT"
libraryDependencies += "org.adbcj" % "adbcj-api" % "0.3-SNAPSHOT"
libraryDependencies += "org.adbcj" % "mysql-async-driver" % "0.3-SNAPSHOT"
Well, most applications probably don’t have a real need for an asynchronous JDBC replacement. Connection pools and running enough threads is good enough. And many applications can use enough caching to reduce the database operation pressure. So the niche for this stuff is small =). Next time I probably shine some more light on ADBCJ itself. Do you think it’s worthwhile to reuse AJDBC? Thanks for the link. I thing I already stumbled upon that project somewhere. Well I used the AJDBC stuff to avoid building yet another dead project from scratch ;). Another small reason is that I think it would be nice to have the core in Java, so that it can be easily be used from Java, Scala, Groovy etc. So is it worth reusing AJDBC? In the current state there not all that much to reuse, implementation wise. Especially for the PostgreeSQL driver, since I didn’t touch and improved that one. It is way behind your implementation. Besides that your implementation seems to have some, like Joda-Time. For now I would build on that. 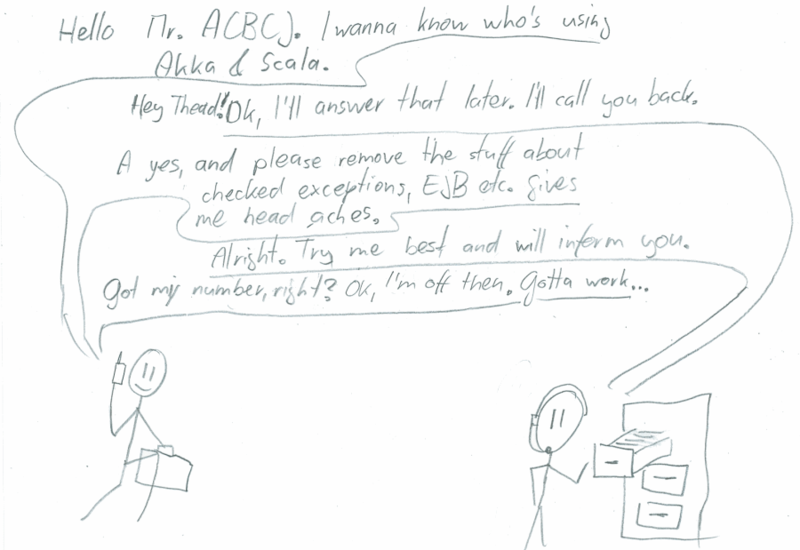 I am new to this Scala, Akka world. I came across Slick to connect to a DB. Can you please help me with whether ADBCJ is better option than Slick ?